The Major Apartments came to Sandy Hill in 1937, but only two of the three were new construction. Image: Google Maps. With all of the beautiful and interesting heritage properties that stand in Ottawa’s Sandy Hill neighbourhood, it’s somewhat interesting that the apartments above are (a) the first buildings that I really remember loving in the neighbourhood, and (b) still among my favourite. In a setting filled with delightful institutional architecture and numerous Victwardian houses, for some, it would be a wonder that a small handful of 1930s apartments are what have stuck in my mind. 175, 177, and 179 Wilbrod were known collectively as the Major Apartments and were (mostly) constructed in 1937. From what I can tell, with three buildings, they make for the second of Ottawa’s cluster apartment developments, only following Wolf Shenkman’s six-building project at Gladstone and Metcalfe. 175 Wilbrod, the apartments. Image: Google Maps. 177 Wilbrod, the new-build triplex. Image: Google Maps. 179 Wilbrod, the large home reformed. Image: Google Maps. In December 1936, Major Investments Limited purchased the duplex at 507-509 Cumberland from l’Association Catholique Feminine for $8,000. The duplex was home to Le Foyer, a Catholic social services organization and home for young women. The property came with generous lot at the rear.1 “To Provide A Home For Working Girls,” Ottawa Journal, February 18, 1911, 5; Jules Tremblay, Le Foyer: la charité en action (Ottawa, 1920); “To Turn Residence Of S.N. Parent Into a Home For Girls,” Ottawa Journal, August 20, 1929, 2; “$3,042,719 Value 1,005 Transfers During Year,” Ottawa Journal, January 1, 1937, 2. 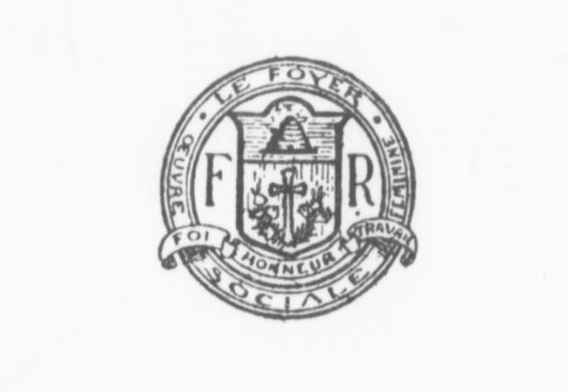 I don’t currently have the burning need for yet another subscription, so rather than 509 Cumberland, here is Le Foyer’s nifty seal. Source: Jules Tremblay, Le Foyer: la charité en action (Ottawa, 1920). Major Investments did not waste much time and began its marketing quickly. 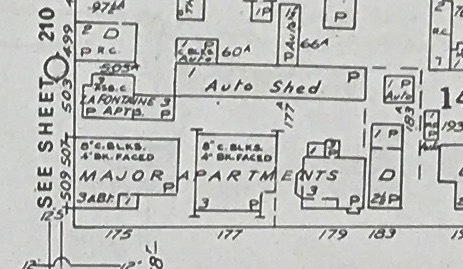 In January 1937, the Journal reported that plans were being put together for a new apartment at the corner of Cumberland and Wilbrod streets. The paper reported that there were other homes on the lot (namely 507-509 Cumberland) and that they were to be demolished as soon as possible. The architect designing the new fireproof apartment was Henry J. Morin, by then of the newly-formed Roper & Morin. Work was expected to start in the spring.2 “New Apartments for Sandy Hill,” Ottawa Journal, January 25, 1937, 12. At the same time as Morin had been drawing up his plans, Major Investments also purchased the adjacent lot and house at 179 Wilbrod from Marie L. Dubé for $5,000.3 “75 Property Transfers During January,” Ottawa Journal, February 3, 1937, 15. The price of the lot with a fifty foot frontage was later reported to be $7,500.4 “Buys Duke Hotel For $28,000,” Ottawa Journal, April 12, 1937, 12. With the spring approaching, Major prepared its call for tenders to construct the apartments. The building was expected to contain 15 units and cost $70,000. As the Depression that was wearing on, an announcement like that was most definitely welcome. Work was expected to begin during the middle of April. The 15-unit building was to have a steel frame, and be constructed of brick and cinder block.5 “Start Work Soon On Apartment,” Ottawa Journal, March 30, 1937, 12. In their glory. Image: Goad’s Atlas, Volume 2 (1956): 214-2. In the meantime, Major changed its plans and had Morin draft plans for a small apartment with two triplexes.6 “To Erect Triplexes And Apartment House,” Ottawa Journal, May 28, 1937, 26. After a few more weeks of decision-making and amendments, tenders were finally called for the project. Instead of the single building announced in March, the project would contain an 11-unit apartment, a newly-constructed triplex, and rather than demolish 179 Wilbrod, the plans now called for the conversion of the large home into the second triplex on the property.7 “Plans Provide For 17 Suites,” Ottawa Journal, June 4, 1937, 10. The contract to construct the two new buildings was awarded to the very busy Ross-Meagher and the conversion of 179 to Monette Construction. Total cost of the project was expected to come in at $73,000.8 “Ross-Meagher Company Gets Apartment Job,” Ottawa Journal, June 15, 1937, 12. The building permit for the new construction was issued for $65,000.9”Two Buildings Cost $65,000,” Ottawa Journal, June 18, 1937, 13. Later accounting valued the two new apartments at $65,000 and the conversion at $7,000, for a total of $72,000. See “$564,200 In Construction For Six Months,” Ottawa Journal, July 5, 1937, 3. The Major Apartments were ready for November. Source: Ottawa Journal, November 27, 1937, 13. Construction (and conversion) of the apartments ran through the summer and they were ready by the Christmas season of that year. The advertised features were much like one would expect in an apartment of the time: being “fireproof”, double-glazed windows, tiled baths, electric appliances abound, it was all present. In spite of the full-page ad in the local papers during the season, there were only two units available.10Ottawa Journal, November 27, 1937, 13. To nearly anybody in Ottawa during those years the name of Major Investments would be familiar. As the real estate and development arm of the Major family’s grocery distribution empire, Major Investments ensured that the family’s mark was made on the city. S.J. Major himself passed away in 1903,11 “Funeral of Late S.J. Major,” Ottawa Journal, June 9, 1903, 1; “The Will of the Late S.J. Major,” Ottawa Journal, July 3, 1903, 1. but the firm was passed into his widow Marie’s more than capable hands, and subsequently into his son’s. Under Marie’s leadership, the firm expanded quickly. It soon outgrew its quarters at 10 York street and moved down to its new headquarters at 126 York.12 “S.J. Major, Ltd., Had Ottawa Start in 1889,” Ottawa Journal, November 14, 1923, 27. New headquarters. Source: Ottawa Journal, April 29, 1914, 29. Part of the S.J. Major success was beer distribution. Source: Ottawa Journal, April 24, 10. This Bud’s for you. Source: Ottawa Journal, September 15, 1915, 11. In 1919, her eldest son, Ascanio, took the helm.13Ibid. Growth of the firm only continued and in 1925, S.J. Major merged with the rapidly-growing National Grocers and Ascanio (or A.J. as he was better known) became a director at the large distributor.14 “Companies In New Merger Announced,” Ottawa Journal, August 15, 1925, 4; “Ottawa’s Representative,” Ottawa Journal, August 22, 1925, 18. Of the adapted 179 Wilbrod? There is much more to research, but most significantly it was the home of Lucien Dubé, who was the superintendent of the House of Commons. Dubé passed away at 70 in 1912 and his widow Victoria remained in the home until her death at 83 in 1928. It was the children, lead by daughter Louise, who sold the home to Major Investments.15 “Lucien Dube Passed Away,” Ottawa Journal, November 21, 1912, 2; “Mrs. Lucien Dube Here Many Years,” Ottawa Journal, January 8, 1930, 2. It was George M. Jarvis who lost his parrot in 1894. Image: Ottawa Journal, July 10, 1894, 7. From what I can tell, the home itself dates back to at least 1878, but this will require much more research. It appears that 179 was reformed into a condominium in 1985. Seems pretty similar. Source: Goad’s Atlas (1878), 28. Source: Goad’s Atlas (1912), 28. 1. ↥ “To Provide A Home For Working Girls,” Ottawa Journal, February 18, 1911, 5; Jules Tremblay, Le Foyer: la charité en action (Ottawa, 1920); “To Turn Residence Of S.N. Parent Into a Home For Girls,” Ottawa Journal, August 20, 1929, 2; “$3,042,719 Value 1,005 Transfers During Year,” Ottawa Journal, January 1, 1937, 2. 2. ↥ “New Apartments for Sandy Hill,” Ottawa Journal, January 25, 1937, 12. 3. ↥ “75 Property Transfers During January,” Ottawa Journal, February 3, 1937, 15. 4. ↥ “Buys Duke Hotel For $28,000,” Ottawa Journal, April 12, 1937, 12. 5. ↥ “Start Work Soon On Apartment,” Ottawa Journal, March 30, 1937, 12. 6. ↥ “To Erect Triplexes And Apartment House,” Ottawa Journal, May 28, 1937, 26. 7. ↥ “Plans Provide For 17 Suites,” Ottawa Journal, June 4, 1937, 10. 8. 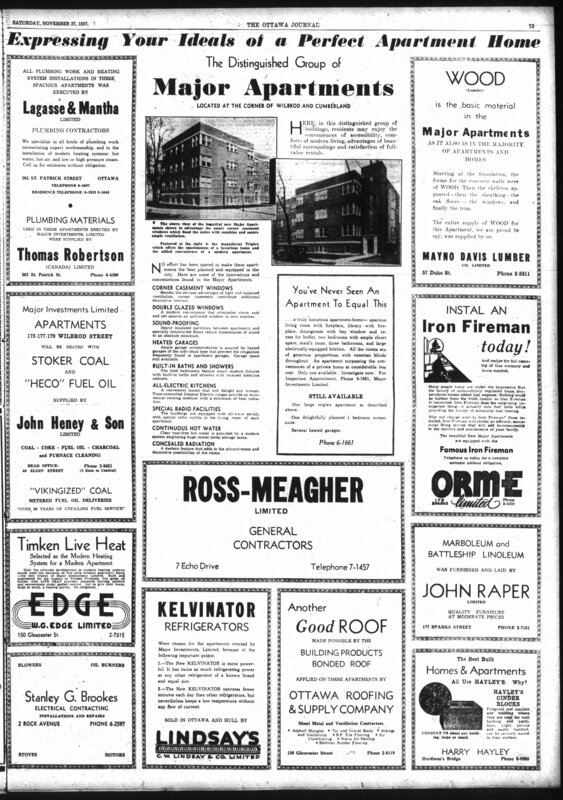 ↥ “Ross-Meagher Company Gets Apartment Job,” Ottawa Journal, June 15, 1937, 12. 9. ↥ ”Two Buildings Cost $65,000,” Ottawa Journal, June 18, 1937, 13. Later accounting valued the two new apartments at $65,000 and the conversion at $7,000, for a total of $72,000. See “$564,200 In Construction For Six Months,” Ottawa Journal, July 5, 1937, 3. 10. ↥ Ottawa Journal, November 27, 1937, 13. 11. ↥ “Funeral of Late S.J. Major,” Ottawa Journal, June 9, 1903, 1; “The Will of the Late S.J. Major,” Ottawa Journal, July 3, 1903, 1. 12. ↥ “S.J. Major, Ltd., Had Ottawa Start in 1889,” Ottawa Journal, November 14, 1923, 27. 14. ↥ “Companies In New Merger Announced,” Ottawa Journal, August 15, 1925, 4; “Ottawa’s Representative,” Ottawa Journal, August 22, 1925, 18. 15. ↥ “Lucien Dube Passed Away,” Ottawa Journal, November 21, 1912, 2; “Mrs. Lucien Dube Here Many Years,” Ottawa Journal, January 8, 1930, 2.